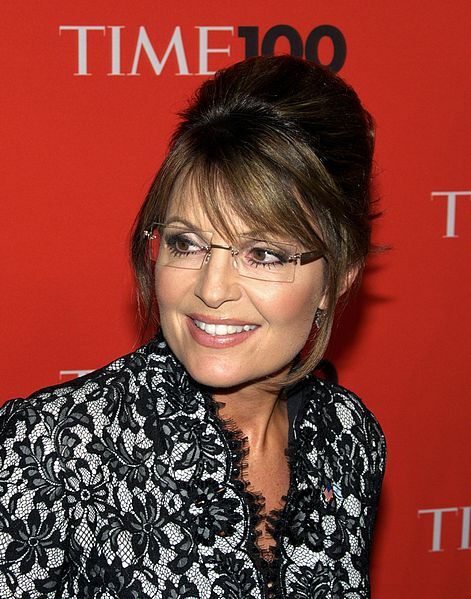 This is the first in a series of articles examining media coverage of the run up to the 2012 US Presidential election. 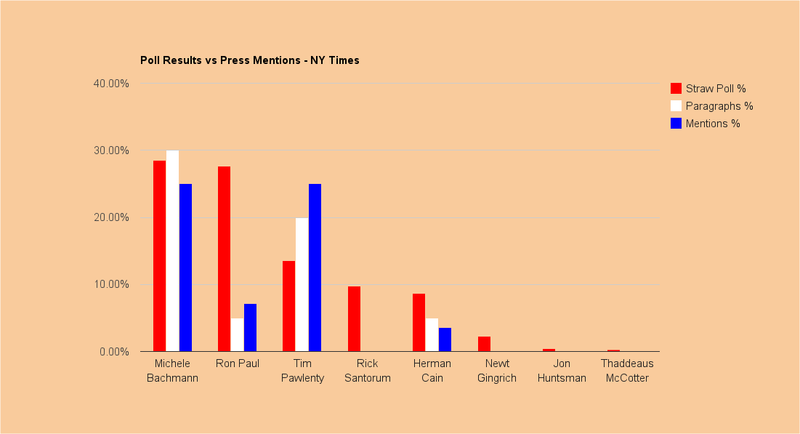 Today we examine the media response to the Iowa Republican straw poll and attempt to find an empirical answer as to whether the media is under-reporting Ron Paul’s candidacy. 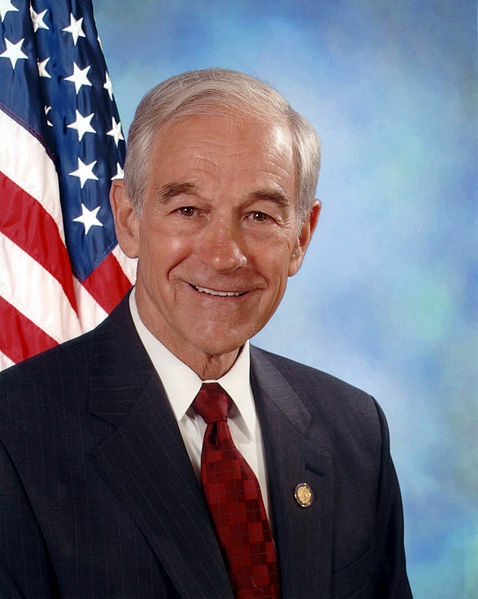 Ron Paul, one of the Republicans hoping to become his party’s Presidential nominee, is an interesting candidate: an obstetrician / gynecologist who has been a member of the House of Representatives on and off for 22 years (1976 to 1977, and again from 1979 to 1985, representing Texas’ 22nd District; 1997 to present representing Texas’ 14th District), Dr Paul has for three decades been considered “on the fringe” of the Republican Party, holding views centered on liberty, freedom and the supremacy of the United States Constitution. Recently, it seems his party is coming around to his views: witness the sudden clamoring for an audit of the Federal Reserve (something Dr Paul has been proposing for many, many years now) and the likewise anti-foreign war tilt of many (but not, notably, all) Republican Presidential aspirants. 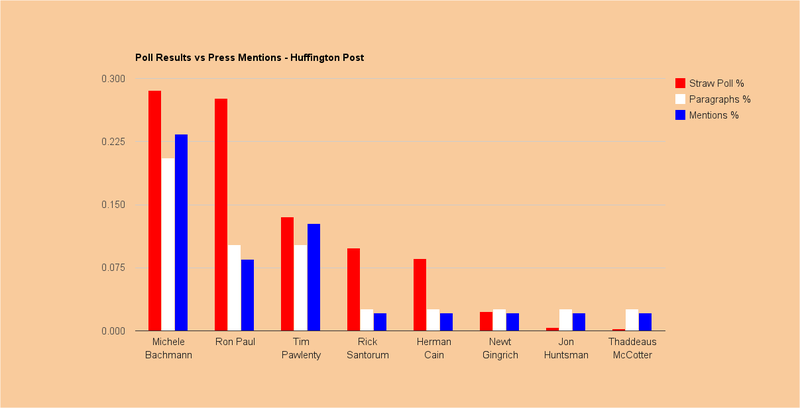 But is Ron Paul getting a fair shake from the media? 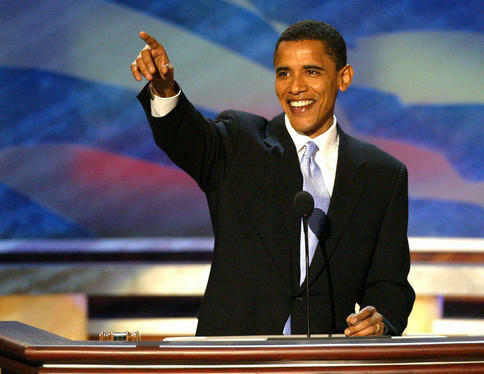 Here is a candidate who set single-day fundraising records in 2007 (and 99.42% of his funding came from individual contributors, with not a cent from federal funding), who has been ahead of the curve on several key issues (notably economic bubbles caused by federal monetary policy and the sagacity of foreign military adventures) and just today finished an extremely close second to Michele Bachmann in the Iowa Republican Presidential straw poll (Mrs Bachmann beat him by just 152 votes). Yet there are more media mentions of Tim Pawlenty, who finished a distant third, receiving fewer than half of Dr Paul’s votes. 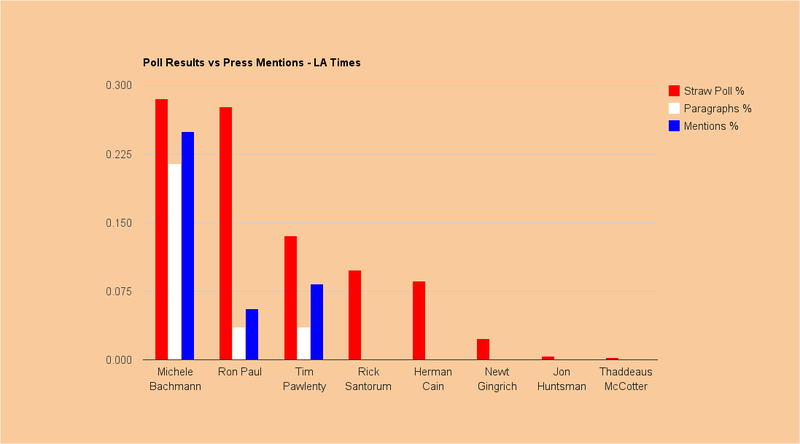 Does it just seem like Ron Paul isn’t getting the recognition he deserves with a second place finish in the straw poll, or is the media actually giving the Paul campaign the cold shoulder? To examine this in further detail, we compared the results of the straw poll with media coverage of that same poll by the New York Times, the Los Angeles Times, the Washington Post, CNN, the Huffington Post and Fox News, which we picked arbitrarily. We examined each article and counted the number of references to each prospective Presidential candidate, as well as the number of paragraphs in which each candidate’s name appears, and then expressed these numbers as a percentage of all candidates’ numbers of mentions and paragraphs. Fox News came closest to giving each candidate a number of mentions and paragraphs proportional to that candidate’s poll showing (but Ron Paul was still substantially under-represented). *****Update 1: strange too how the results of the Ames straw poll were announced by the organizers – or rather, weren’t: Michele Bachmann was announced as the winner, and that was it – no announcement of how the rest of the field fared, which is particularly strange given that Ron Paul came in second by just 152 votes. You can see the announcement here (see also around the 2:35 mark, as Paul’s numbers are shown on the board and the crowd reacts).